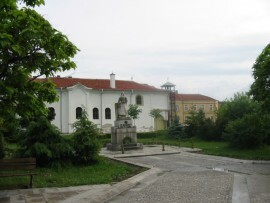 The Elhovo settlement system is situated in the south-east part of the District of Yambol. It encompasses part of the lowland-hilly and low-mountain Tounja Area -a region of the middle valley of the Tounja River and part of the Dervent elevations. 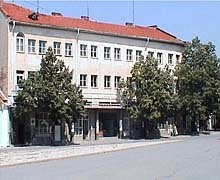 It borders the Topolovgrad municipality, District of Haskovo, to the southwest, the Bolyarovo municipality to the east, the Republic of Turkey to the southeast, The total territory of the Elhovo municipality is 708 sq. km and encompasses 22 settlements. The town of Elhovo is situated along the valley of the Lower Toundzha River. The favourable natural conditions made human presence possible in the region as early as the Neolithic (6000-4000 BC). Evidence for that are the discovered stone and copper tools and the hand-made pottery with carved ornaments. The Bronze Age culture was that of the Thracians. There are preserved remains of Thracian fortresses, settlements and burial mounds. Most of the artifacts discovered in them are fragments of pottery, weapons, tools and votive tablets with the image of the Thracian Horseman. The Thracians also left interestingly built megalithic tombs called dolmens. It was the Thracians that built the first settlement near the present-day town, which was known as Orouditsa. The region fell under Roman rule in 72 BC. They fortified the settlement and called it Orudica ad Burgum - a road station between Cabile and Adrianopolis. The Romans left many traces of their material culture, mostly fragments of pottery and structural ceramics, coins and bronze sculptures. The town was known as Yoanitsa during the early Middle Ages. The Slavs settled permanently on the Balkan Peninsula in c. 7 AD. They pronounced the name of the town as Yanitsa. The Elhovo region was annexed to the Bulgarian state, which was officially founded in 681, during the rule of Khan Kroum (802-814). A proof to that is the famous Hambarlii Inscription, which was found in the near the present-day village of Malomirovo. The town was conquered by the troops of Timourtash Bey in 1373. That event was the start of the hardest period in the historical development of Elhovo - the five-century Ottoman rule. The first form of resistance against the Ottoman oppressors was the haidout movement (more or less chaotic struggle by small groups of rebels) - especially popular among its leaders were Indzhe Voivoda and Kara Kolyu. An organized revolutionary movement was started in1872 with the foundation of a Secret Revolutionary Committee headed by the tailor Dzhenko Dimitrov. The town welcomed its liberation on 21 January 1878 at a great sacrifice of life. The years at the end of c. 19 and the beginning of c. 20 were marked by the struggles of the Bulgarian people for the realization of its national ideal - a free and united Bulgarian state. The soldiers from the Elhovo region fought bravely and many of them died with the name of Bulgaria on their last breath. The town changed radically in the second half of c. 20, affirming itself as a leading administrative and economic centre. Overcoming the latest difficult period in its historical destiny, the Elhovo region today strives for a better future. There is a lot of work yet to be done for its becoming a well-developed and prosperous part of Bulgaria. This is the aim of all people who are connected with it and devoted to it. 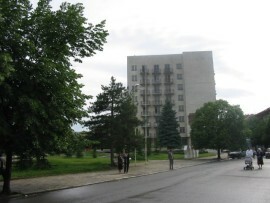 20 270 people live in the Elhovo municipality, including 13 119 people in the town of Elhovo, forming approx. 65% of the municipality's total population. The average January temperature is about 0 C, the average July temperature is about 23 C.
The reservations near Elhovo contribute to its unique peaceful atmosphere and give its citizens the chance to have walks in the undisturbed nature, tasting of its charm and magic. - There are also opportunities to observe Bulgarian wildlife, such as fox, jackal, hare, wild boar, fallow deer etc.